The Viczian lab wants to understand why a group of seemingly similar cells in the early embryonic eye choose to become one retinal cell type and not another. 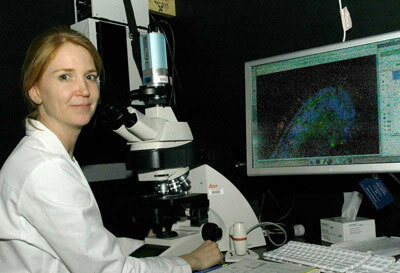 They are also interested in early molecular events in generating retinal cells from pluripotent cells. Her group has discovered that the extrinsic factor, Noggin, represses both BMP and Activin signaling in generating retina from pluripotent cells in frog. They are now looking at this molecular mechanism, as well as, using this and other proteins to generate specific retinal cells in mouse embryonic stem cell cultures. They are particularly interested in cone photoreceptors. Cones are necessary for all of our daylight vision, but relatively little is known about their formation. 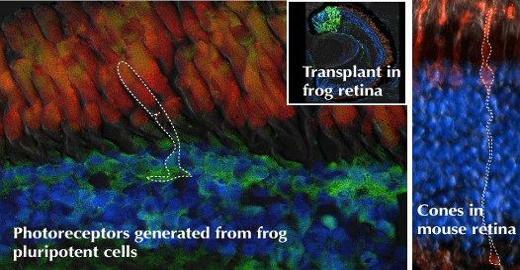 Replacing these cells in blind or nearly blind individuals could restore everyday vision. The challenge is to understand the key factors in the embryonic environment necessary to recreate this milieu in the petri dish. The successful completion of this work could provide a plentiful source of the sight-saving cells for cell replacement therapy. Dr. Viczian is funded by the National Eye Institute (NIH). Her work has been previously funded by Research to Prevent Blindness, E. Matilda Zeigler Foundation and the British Council.